This item is currently out of stock, please check back later! FREE FRAGRANCE (1 OZ) INCLUDED. SELECT ABOVE. ADJUSTABLE HEAT SETTINGS. Electric warmer comes with 35 watt bulb, glass bowl, and dimmer control. 1 oz glass bottle. Just add a few squirts of fragrance to any type of Oil Warmer and enjoy the lasting diffusion! Add water to soften fragrance if preferred. Visit our blog to find many more uses for our oils. 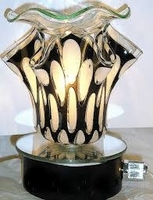 CHECKOUT OUR WIDE VARIETY OF OIL WARMERS.